This is a sponsored post written on behalf of Kohler Co.
Let's face it, no one can wreck a clean bathroom quite like a little boy can. My sweet little angel baby is as cute as they come but once left alone in a bathroom all things sweet and cute disappear and somehow things go wild. And quick. 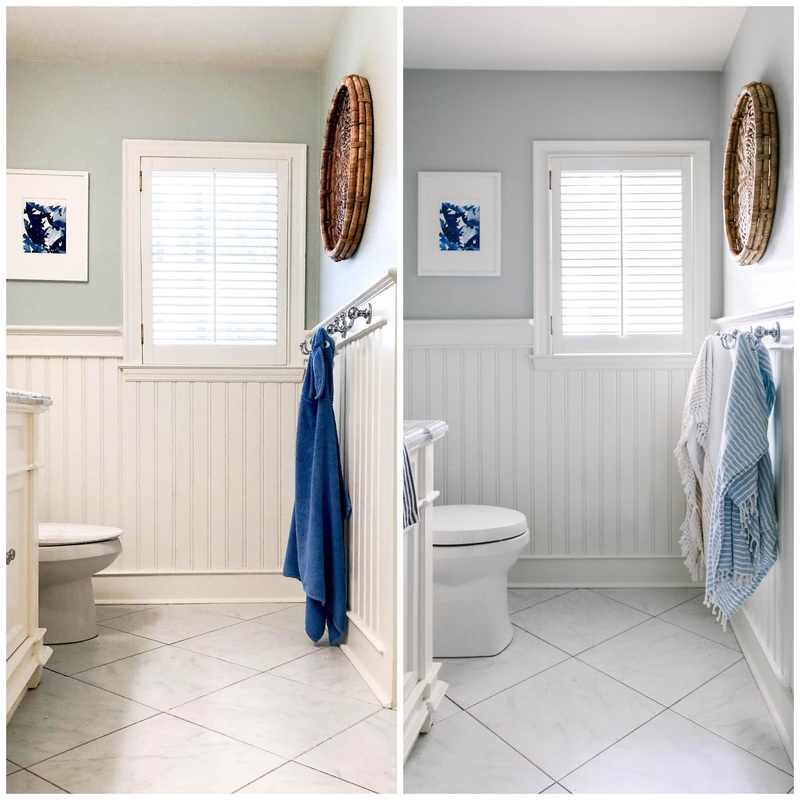 To add insult to injury, our hall bath serves many purposes - it's both our children's bathroom and our guest bath, plus it's very visible in it's high traffic location, making it very difficult for this mama to hide away our boy bathroom happenings. 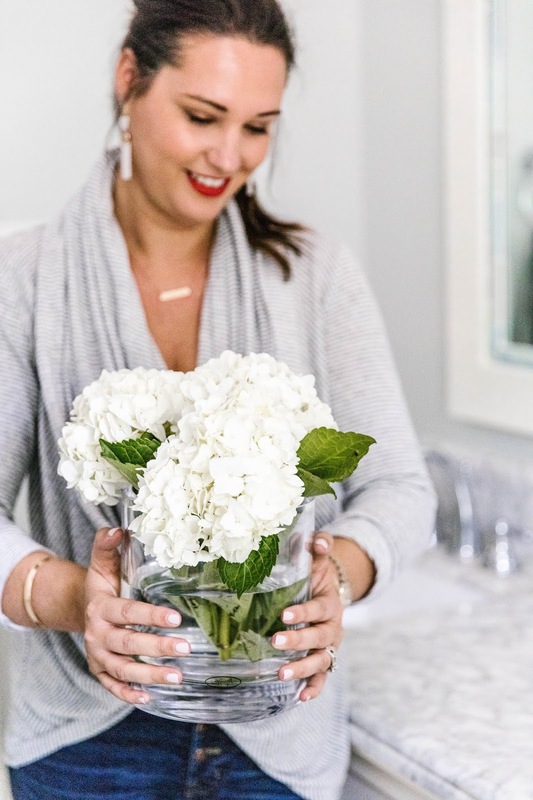 In the few months that we've lived in this house, I've learned a few simple tricks of the mom trade to keep our bathroom as clean as possible so that guests and our kiddos can be comfortable in the space. And the most important trick? A self cleaning toilet bowl. Yep, a toilet that cleans itself....I couldn't believe it either, but it's true. Our KOHLER Corbelle toilet comes complete with the ContinuousClean System that automatically dispenses cleaning solution with every flush. Every. Flush. Besides cleaning itself (as if I could ask for anything more) using the ContinousClean technology which automatically dispenses a consistent amount of toilet bowl cleaner with every flush and uses CleanCoat technology to actually prevent bacteria, mildew and mineral deposit build up, the KOHLER Corbelle also taught me two other little boy bathroom must have's....wanna know what they are? Check out numbers 2 and 4 below! 1. Night lights. All of the night lights. Little boys don't need a single reason to miss the bowl, a dark bathroom included, so stock that bathroom with all of the night lights. We have precious little outlet space in that bathroom (only one outlet, believe it or not) so we have one plugged in on the wall farthest from the toilet. 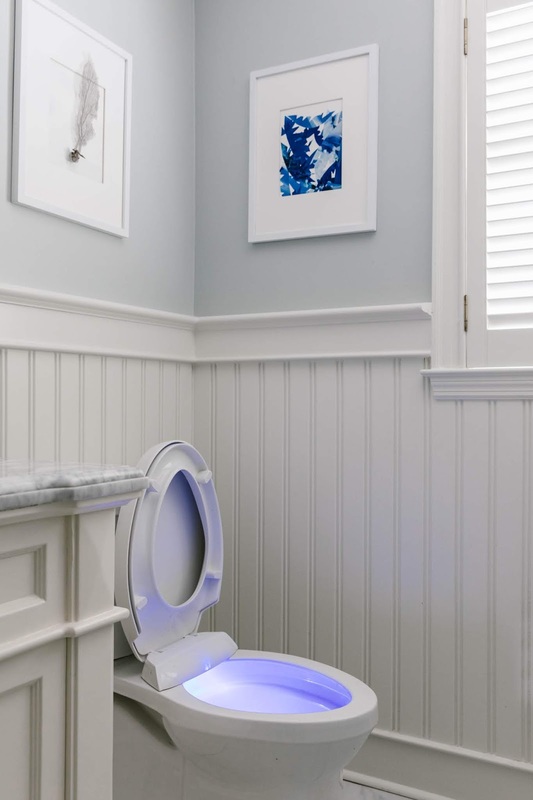 Trust me when I say that it became very clear that we needed a little light shed on the toilet area so when KOHLER told me about their Purefresh toilet set, complete with it's own nightlight, I jumped at the chance to install it. 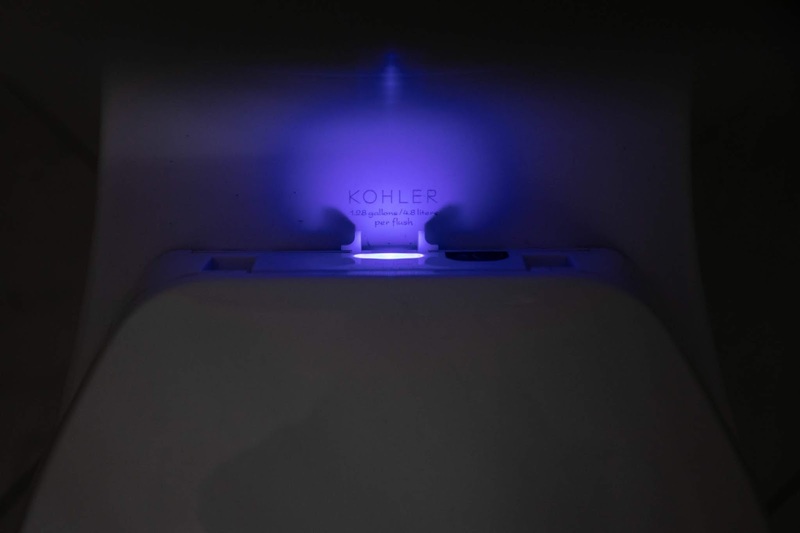 Our Purefresh toilet seat now sits proudly atop our KOHLER Corebelle toilet and shines it's soft blue glow right into the toilet bowl (when open) or lights up the toilet back when closed. It's like a little beacon in the night, guiding my boy to do his business in a spot that won't require me to scrub tile at first dawn. I love it. Nothing will wake you in the night like the slam of a toilet seat so make sure you snag one for your boy bath that has a soft, slow close. Our Purefresh toilet seat has a slow close and soft grip bumpers so that it doesn't shift around when you open, close or use it as a launching pad for your LEGO superhero men. As an aside, when it comes to teaching boys to close the lid, I'll take all the help I can get, so the fact that the Purefresh seat won't slam on little fingers is a huge help in encouraging my guy to close it up! As a bonus, the Purefresh seat also cleans and deodorizes with a built in carbon air neutralizer that automatically dispenses after use. 3. No Bath Mats, Ever. 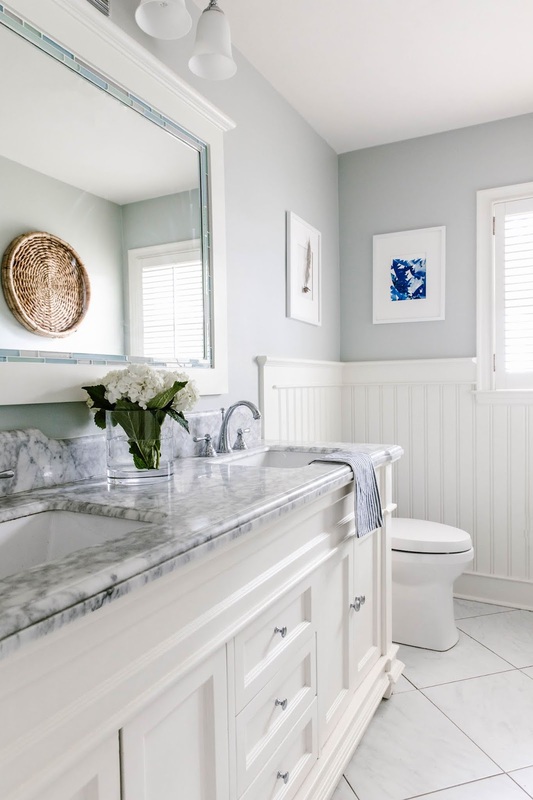 I know, I know, the tile can get cold at night, but I'm here to tell you that bathmats by the tub even over by the sink can soak up all kinds of liquids, and no body needs that in a little boy bathroom. We use an extra towel at bath time as a mat and to soak up splashes, and toss it in the wash with the bath towels. 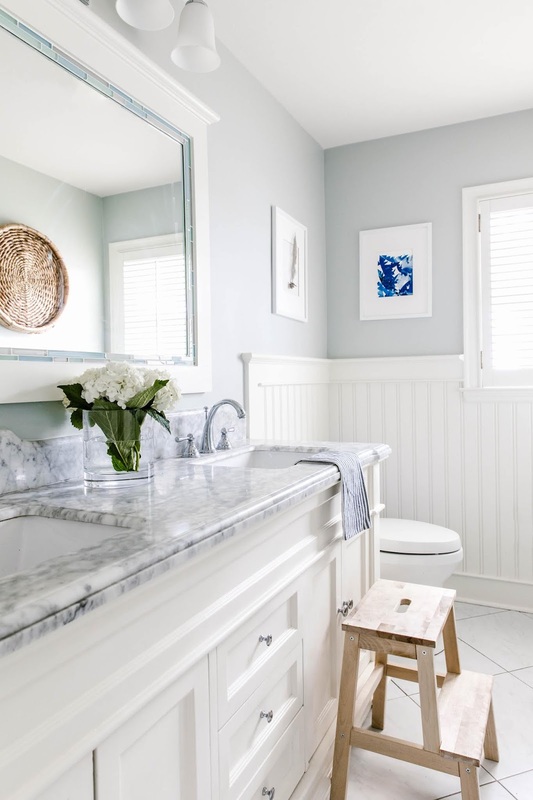 If you think your little boy bathroom has a bit of a smell, I'll bet it's from that poor, unsuspecting bath mat that seems to be way too far from the toilet to be the culprit! I'll just go ahead and say it: an elongated toilet bowl gives little boys a larger target, ensuring we mamas and papas spend less time cleaning behind the bowl, the floor and even up the walls. 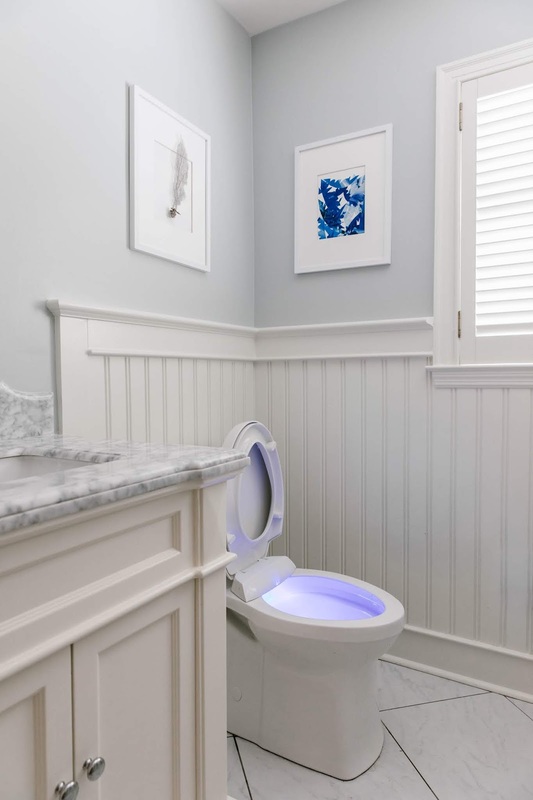 The Corbelle toilet base provides more room for target practice and more comfort for our grown up guests. When it comes to choosing stools and steps for your little boy, be sure that the stool you are using for your potty is plastic and has a non slip base. Plastic because you'll want to be able to hose that thing off in bleach and rubbed based because when it get's liquid under it (and it will), you'll be glad that it can't slip out from under those wiggly little feet. We use a multi step, sealed wooden stool for our sink area and make sure to give it a wipe down with a bleach wipe regularly. Now go forth and baby boy proof those bathrooms! P.S. The Kohler Corbelle toilet is an ease to install thanks to the patented ReadyLock installation system. You can read more about it here ContinuousClean!